Julia Bryan-Wilson’s essay “Invisible Products” explores a most unusual archive of photographs by Ansel Adams—some seven thousand photographs he took in the mid-1960s on commission from the University of California. The university intended the photographs to serve as a composite portrait of its campuses, labs, ranches, and research centers. In 1967, 179 of them were published in the book Fiat Lux, with a text by Nancy Newhall. Bryan-Wilson notes that the project “was the largest undertaking Adams ever pursued aside from his lifelong dedication to photographing Yosemite.” Her essay, illustrated with more than twenty of the Adams photographs, including several never before published, notes that the gaps in the body of images are often as revealing as the photographs themselves. In a coda to her essay, Bryan-Wilson contrasts the Adams project with a more recent photo—the image of the campus security officer who in November 2011 strode along a group of seated, peaceful protestors at UC Davis, dousing them with orange pepper spray. 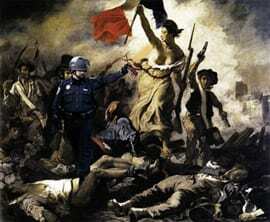 She writes, “Within days, the pepper-spray photo spawned a wealth of parodies that were visible all over the globe, through social media and the internet, in which the photo no longer existed merely as evidentiary document, but as material for dozens of detourné mash-ups.” She comments on one such work, based on a painting of Eugène Delacroix. For a gallery of mash-ups, please visit http://peppersprayingcop.tumblr.com/.